A microorganism (from the Greek: îï¿½îï¿½îï¿½Ï�ÏŒÏ‚, mikrÃ³s, "small" and áï¿½ï¿½Ï�îï¿½îï¿½îï¿½îï¿½Ïƒîï¿½ÏŒÏ‚, organismÃ³s, "organism"; also spelled micro organism or micro-organism) or microbe is an organism that is microscopic (too small to be seen by the naked human eye). The study of microorganisms is called microbiology, a subject that began with Anton van Leeuwenhoek's discovery of microorganisms in 1675, using a microscope of his own design. Microorganisms are very diverse; they include bacteria, fungi, archaea, and protists; microscopic plants (green algae); and animals such as plankton and the planarian. Some microbiologists also include viruses, but others consider these as non-living. Most microorganisms are unicellular (single-celled), but this is not universal, since some multicellular organisms are microscopic, while some unicellular protists and bacteria, like Thiomargarita namibiensis, are macroscopic and visible to the naked eye. Microbes are also exploited by people in biotechnology, both in traditional food and beverage preparation, and in modern technologies based on genetic engineering. However, pathogenic microbes are harmful, since they invade and grow within other organisms, causing diseases that kill people, other animals and plants. Single-celled microorganisms were the first forms of life to develop on Earth, approximately 3'4 billion years ago. Further evolution was slow, and for about 3 billion years in the Precambrian eon, all organisms were microscopic. So, for most of the history of life on Earth the only forms of life were microorganisms. Bacteria, algae and fungi have been identified in amber that is 220 million years old, which shows that the morphology of microorganisms has changed little since the Triassic period. Most microorganisms can reproduce rapidly and microbes such as bacteria can also freely exchange genes by conjugation, transformation and transduction between widely-divergent species. This horizontal gene transfer, coupled with a high mutation rate and many other means of genetic variation, allows microorganisms to swiftly evolve (via natural selection) to survive in new environments and respond to environmental stresses. This rapid evolution is important in medicine, as it has led to the recent development of 'super-bugs' ' pathogenic bacteria that are resistant to modern antibiotics. In The Canon of Medicine (1020), AbÅ« Alä« ibn Sä«näï¿½ (Avicenna) stated that bodily secretion is contaminated by foul foreign earthly bodies before being infected. He also hypothesized that tuberculosis and other diseases might be contagious, i.e. that they were infectious diseases, and used quarantine to limit their spread. When the Black Death bubonic plague reached Andalusia in Spain, in the 14th century, Ibn Khatima wrote that infectious diseases were caused by contagious "minute bodies" that enter the human body. Later, in 1546, Girolamo Fracastoro proposed that epidemic diseases were caused by transferable seedlike entities that could transmit infection by direct or indirect contact, or even without contact over long distances. All these early claims about the existence of microorganisms were speculative and were not based on any data or science. Microorganisms were neither proven, observed, nor correctly and accurately described until the 17th century. The reason for this was that all these early studies lacked the microscope. Antonie van Leeuwenhoek, the first microbiologist and the first to observe microorganisms using a microscope. Anton van Leeuwenhoek was one of the first people to observe microorganisms, using a microscope of his own design, and made one of the most important contributions to biology. Robert Hooke was the first to use a microscope to observe living things; his 1665 book Micrographia contained descriptions of plant cells. Before Leeuwenhoek's discovery of microorganisms in 1675, it had been a mystery why grapes could be turned into wine, milk into cheese, or why food would spoil. Leeuwenhoek did not make the connection between these processes and microorganisms, but using a microscope, he did establish that there were forms of life that were not visible to the naked eye. Leeuwenhoek's discovery, along with subsequent observations by Lazzaro Spallanzani and Louis Pasteur, ended the long-held belief that life spontaneously appeared from non-living substances during the process of spoilage. Lazzaro Spallanzani found that boiling broth would sterilise it and kill any microorganisms in it. He also found that new microorganisms could only settle in a broth if the broth was exposed to the air. Louis Pasteur expanded upon Spallanzani's findings by exposing boiled broths to the air, in vessels that contained a filter to prevent all particles from passing through to the growth medium, and also in vessels with no filter at all, with air being admitted via a curved tube that would not allow dust particles to come in contact with the broth. By boiling the broth beforehand, Pasteur ensured that no microorganisms survived within the broths at the beginning of his experiment. Nothing grew in the broths in the course of Pasteur's experiment. This meant that the living organisms that grew in such broths came from outside, as spores on dust, rather than spontaneously generated within the broth. Thus, Pasteur dealt the death blow to the theory of spontaneous generation and supported germ theory. In 1876, Robert Koch established that microbes can cause disease. He found that the blood of cattle who were infected with anthrax always had large numbers of Bacillus anthracis. Koch found that he could transmit anthrax from one animal to another by taking a small sample of blood from the infected animal and injecting it into a healthy one, and this caused the healthy animal to become sick. He also found that he could grow the bacteria in a nutrient broth, then inject it into a healthy animal, and cause illness. Based on these experiments, he devised criteria for establishing a causal link between a microbe and a disease and these are now known as Koch's postulates. Although these postulates cannot be applied in all cases, they do retain historical importance to the development of scientific thought and are still being used today. Consisting of two domains, bacteria and archaea, the prokaryotes are the most diverse and abundant group of organisms on Earth and inhabit practically all environments where some liquid water is available and the temperature is below +140 –C. They are found in sea water, soil, air, animals' gastrointestinal tracts, hot springs and even deep beneath the Earth's crust in rocks. Practically all surfaces which have not been specially sterilized are covered by prokaryotes. The number of prokaryotes on Earth is estimated to be around five million trillion trillion, or 5 Ã— 1030, accounting for at least half the biomass on Earth. Bacteria are practically all invisible to the naked eye, with a few extremely rare exceptions, such as Thiomargarita namibiensis. They lack membrane-bound organelles, and can function and reproduce as individual cells, but often aggregate in multicellular colonies. Their genome is usually a single loop of DNA, although they can also harbor small pieces of DNA called plasmids. These plasmids can be transferred between cells through bacterial conjugation. Bacteria are surrounded by a cell wall, which provides strength and rigidity to their cells. They reproduce by binary fission or sometimes by budding, but do not undergo sexual reproduction. Some species form extraordinarily resilient spores, but for bacteria this is a mechanism for survival, not reproduction. Under optimal conditions bacteria can grow extremely rapidly and can double as quickly as every 10 minutes. Archaea were originally described in extreme environments, such as hot springs, but have since been found in all types of habitats. Only now are scientists beginning to realize how common archaea are in the environment, with crenarchaeota being the most common form of life in the ocean, dominating ecosystems below 150 m in depth. These organisms are also common in soil and play a vital role in ammonia oxidation. Microorganisms are used in brewing, winemaking, baking, pickling and other food-making processes. They are also used to control the fermentation process in the production of cultured dairy products such as yogurt and cheese. The cultures also provide flavour and aroma, and inhibit undesirable organisms. Specially-cultured microbes are used in the biological treatment of sewage and industrial waste effluent, a process known as bioaugmentation. Microbes are used in fermentation to produce ethanol, and in biogas reactors to produce methane. Scientists are researching the use of algae to produce liquid fuels, and bacteria to convert various forms of agricultural and urban waste into usable fuels. 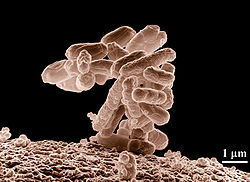 Microbes are also essential tools in biotechnology, biochemistry, genetics, and molecular biology. The yeasts (Saccharomyces cerevisiae) and fission yeast (Schizosaccharomyces pombe) are important model organisms in science, since they are simple eukaryotes that can be grown rapidly in large numbers and are easily manipulated. They are particularly valuable in genetics, genomics and proteomics. Microbes can be harnessed for uses such as creating steroids and treating skin diseases. Scientists are also considering using microbes for living fuel cells, and as a solution for pollution. In the Middle Ages, diseased corpses were thrown into castles during sieges using catapults or other siege engines. Individuals near the corpses were exposed to the deadly pathogen and were likely to spread that pathogen to others. Microbes are critical to the processes of decomposition required to cycle nitrogen and other elements back to the natural world. ^ Rybicki EP (1990). "The classification of organisms at the edge of life, or problems with virus systematics". S Aft J Sci 86: 182'6. ISSN 0038-2353. ^ LWOFF A (1957). "The concept of virus". J. Gen. Microbiol. 17 (2): 239'53. PMID 13481308. ^ Christner BC, Morris CE, Foreman CM, Cai R, Sands DC (2008). "Ubiquity of biological ice nucleators in snowfall". Science 319 (5867): 1214. doi:10.1126/science.1149757. PMID 18309078. ^ Schopf J (2006). "Fossil evidence of Archaean life". Philos Trans R Soc Lond B Biol Sci 361 (1470): 869'85. doi:10.1098/rstb.2006.1834. PMID 16754604. PMC 1578735. http://www.journals.royalsoc.ac.uk/content/g38537726r273422/fulltext.pdf. ^ Altermann W, Kazmierczak J (2003). "Archean microfossils: a reappraisal of early life on Earth". Res Microbiol 154 (9): 611'7. doi:10.1016/j.resmic.2003.08.006. PMID 14596897. ^ Cavalier-Smith T (2006). "Cell evolution and Earth history: stasis and revolution". Philos Trans R Soc Lond B Biol Sci 361 (1470): 969'1006. doi:10.1098/rstb.2006.1842. PMID 16754610. PMC 1578732. http://www.journals.royalsoc.ac.uk/content/0164755512w92302/fulltext.pdf. ^ Stanley S (May 1973). "An Ecological Theory for the Sudden Origin of Multicellular Life in the Late Precambrian". Proc Natl Acad Sci USA 70 (5): 1486'9. doi:10.1073/pnas.70.5.1486. PMID 16592084. ^ DeLong E, Pace N (2001). "Environmental diversity of bacteria and archaea". Syst Biol 50 (4): 470'8. doi:10.1080/106351501750435040. PMID 12116647. ^ Schmidt A, Ragazzi E, Coppellotti O, Roghi G (2006). "A microworld in Triassic amber". Nature 444 (7121): 835. doi:10.1038/444835a. PMID 17167469. ^ Wolska K (2003). "Horizontal DNA transfer between bacteria in the environment". Acta Microbiol Pol 52 (3): 233'43. PMID 14743976. ^ Enright M, Robinson D, Randle G, Feil E, Grundmann H, Spratt B (May 2002). "The evolutionary history of methicillin-resistant Staphylococcus aureus (MRSA)". Proc Natl Acad Sci USA 99 (11): 7687'92. doi:10.1073/pnas.122108599. PMID 12032344. PMC 124322. http://www.pnas.org/cgi/pmidlookup?view=long&pmid=12032344. ^ a b Syed, Ibrahim B. (2002). "Islamic Medicine: 1000 years ahead of its times". Journal of the Islamic Medical Association 2: 2'9. ^ Tschanz, David W.. "Arab Roots of European Medicine". Heart Views 4 (2). ^ Colgan, Richard (2009). Advice to the Young Physician: On the Art of Medicine. Springer. p. 33. ISBN 9781441910332. http://books.google.com/?id=DoMVs4HuDAoC&pg=PA33&dq=avicenna+infectious+diseases+quarantine&q=avicenna%20infectious. ^ Leeuwenhoek A (1753). "Part of a Letter from Mr Antony van Leeuwenhoek, concerning the Worms in Sheeps Livers, Gnats, and Animalcula in the Excrements of Frogs". Philosophical Transactions (1683'1775) 22: 509'18. doi:10.1098/rstl.1700.0013. http://www.journals.royalsoc.ac.uk/link.asp?id=4j53731651310230. Retrieved 30 November 2006. ^ Leeuwenhoek A (1753). "Part of a Letter from Mr Antony van Leeuwenhoek, F. R. S. concerning Green Weeds Growing in Water, and Some Animalcula Found about Them". Philosophical Transactions (1683'1775) 23: 1304'11. doi:10.1098/rstl.1702.0042. http://www.journals.royalsoc.ac.uk/link.asp?id=fl73121jk4150280. Retrieved 30 November 2006. ^ O'Brien S, Goedert J (1996). "HIV causes AIDS: Koch's postulates fulfilled". Curr Opin Immunol 8 (5): 613'18. doi:10.1016/S0952-7915(96)80075-6. PMID 8902385. ^ a b Gold T (1992). "The deep, hot biosphere". Proc. Natl. Acad. Sci. U.S.A. 89 (13): 6045'9. doi:10.1073/pnas.89.13.6045. PMID 1631089. ^ Whitman W, Coleman D, Wiebe W (1998). "Prokaryotes: the unseen majority". Proc Natl Acad Sci USA 95 (12): 6578'83. doi:10.1073/pnas.95.12.6578. PMID 9618454. ^ Shapiro JA (1998). "Thinking about bacterial populations as multicellular organisms". Annu. Rev. Microbiol. 52: 81'104. doi:10.1146/annurev.micro.52.1.81. PMID 9891794. http://www.sci.uidaho.edu/newton/math501/Sp05/Shapiro.pdf. ^ Eagon R (1962). "Pseudomonas natriegens, a marine bacterium with a generation time of less than 10 minutes". J Bacteriol 83: 736'7. PMID 13888946. ^ Woese C, Kandler O, Wheelis M (1990). "Towards a natural system of organisms: proposal for the domains Archaea, Bacteria, and Eucarya". Proc Natl Acad Sci USA 87 (12): 4576'9. doi:10.1073/pnas.87.12.4576. PMID 2112744. ^ De Rosa M, Gambacorta A, Gliozzi A (1 March 1986). "Structure, biosynthesis, and physicochemical properties of archaebacterial lipids". Microbiol. Rev. 50 (1): 70'80. PMID 3083222. PMC 373054. http://mmbr.asm.org/cgi/pmidlookup?view=long&pmid=3083222. ^ Robertson C, Harris J, Spear J, Pace N (2005). "Phylogenetic diversity and ecology of environmental Archaea". Curr Opin Microbiol 8 (6): 638'42. doi:10.1016/j.mib.2005.10.003. PMID 16236543. ^ Karner MB, DeLong EF, Karl DM (2001). "Archaeal dominance in the mesopelagic zone of the Pacific Ocean". Nature 409 (6819): 507'10. doi:10.1038/35054051. PMID 11206545. ^ Sinninghe DamstÃ© JS, Rijpstra WI, Hopmans EC, Prahl FG, Wakeham SG, Schouten S (June 2002). "Distribution of membrane lipids of planktonic Crenarchaeota in the Arabian Sea". Appl. Environ. Microbiol. 68 (6): 2997'3002. doi:10.1128/AEM.68.6.2997-3002.2002. PMID 12039760. PMC 123986. http://aem.asm.org/cgi/pmidlookup?view=long&pmid=12039760. ^ Leininger S, Urich T, Schloter M, et al. (2006). "Archaea predominate among ammonia-oxidizing prokaryotes in soils". Nature 442 (7104): 806'9. doi:10.1038/nature04983. PMID 16915287. ^ a b Dyall S, Brown M, Johnson P (2004). "Ancient invasions: from endosymbionts to organelles". Science 304 (5668): 253'7. doi:10.1126/science.1094884. PMID 15073369. ^ Cavalier-Smith T (1 December 1993). "Kingdom protozoa and its 18 phyla". Microbiol. Rev. 57 (4): 953'94. PMID 8302218. PMC 372943. http://mmbr.asm.org/cgi/pmidlookup?view=long&pmid=8302218. ^ Corliss JO (1992). "Should there be a separate code of nomenclature for the protists?". BioSystems 28 (1-3): 1'14. doi:10.1016/0303-2647(92)90003-H. PMID 1292654. ^ Devreotes P (1989). "Dictyostelium discoideum: a model system for cell-cell interactions in development". Science 245 (4922): 1054'8. doi:10.1126/science.2672337. PMID 2672337. ^ Slapeta J, Moreira D, LÃ³pez-GarcÃ­a P (2005). "The extent of protist diversity: insights from molecular ecology of freshwater eukaryotes". Proc. Biol. Sci. 272 (1576): 2073'81. doi:10.1098/rspb.2005.3195. PMID 16191619. PMC 1559898. http://journals.royalsociety.org/openurl.asp?genre=article&id=doi:10.1098/rspb.2005.3195. ^ Moreira D, LÃ³pez-GarcÃ­a P (2002). "The molecular ecology of microbial eukaryotes unveils a hidden world". Trends Microbiol. 10 (1): 31'8. doi:10.1016/S0966-842X(01)02257-0. PMID 11755083. ^ At least one animal group is unicellular in its adult form: see Myxozoa. ^ Lapinski J, Tunnacliffe A (2003). "Anhydrobiosis without trehalose in bdelloid rotifers". FEBS Lett. 553 (3): 387'90. doi:10.1016/S0014-5793(03)01062-7. PMID 14572656. ^ Kumamoto CA, Vinces MD (2005). "Contributions of hyphae and hypha-co-regulated genes to Candida albicans virulence". Cell. Microbiol. 7 (11): 1546'54. doi:10.1111/j.1462-5822.2005.00616.x. PMID 16207242. ^ Thomas, David C. (2002). Seaweeds. London: Natural History Museum. ISBN 0-565-09175-1. ^ Szewzyk U, Szewzyk R, StenstrÃ¶m T (1994). "Thermophilic, anaerobic bacteria isolated from a deep borehole in granite in Sweden". Proc Natl Acad Sci USA 91 (5): 1810'3. doi:10.1073/pnas.91.5.1810. PMID 11607462. ^ Horneck G (1981). "Survival of microorganisms in space: a review". Adv Space Res 1 (14): 39'48. doi:10.1016/0273-1177(81)90241-6. PMID 11541716. ^ Strain 121, a hyperthermophilic archaea, has been shown to reproduce at 121 –C (250 –F), and survive at 130 –C (266 –F). ^ Some Psychrophilic bacteria can grow at '17 –C (1.4 –F), and can survive near absolute zero. ^ Picrophilus can grow at pH -0.06. ^ The alkaliphilic bacteria Bacillus alcalophilus can grow at up to pH 11.5. ^ Dyall-Smith, Mike, HALOARCHAEA, University of Melbourne. See also Haloarchaea. ^ The piezophilic bacteria Halomonas salaria requires a pressure of 1,000 atm; nanobes, a speculative organism, have been reportedly found in the earth's crust at 2,000 atm. ^ Cavicchioli R (2002). "Extremophiles and the search for extraterrestrial life". Astrobiology 2 (3): 281'92. doi:10.1089/153110702762027862. PMID 12530238. ^ Barea J, Pozo M, AzcÃ³n R, AzcÃ³n-Aguilar C (2005). "Microbial co-operation in the rhizosphere". J Exp Bot 56 (417): 1761'78. doi:10.1093/jxb/eri197. PMID 15911555. ^ Gillen, Alan L. (2007). The Genesis of Germs: The Origin of Diseases and the Coming Plagues. New Leaf Publishing Group. p. 10. ISBN 0-890-51493-3. ^ "Dairy Microbiology". University of Guelph. http://www.foodsci.uoguelph.ca/dairyedu/micro.html. Retrieved 2006-10-09. ^ Gray, N.F. (2004). Biology of Wastewater Treatement. Imperial College Press. p. 1164. ISBN 1-860-94332-2. ^ Kitani, Osumu and Carl W. Hall (1989). Biomass Handbook. Taylor & Francis US. p. 256. ISBN 2-881-24269-3. ^ Pimental, David (2007). Food, Energy, and Society. CRC Press. p. 289. ISBN 1-420-04667-5. ^ Tickell, Joshua et al. (2000). From the Fryer to the Fuel Tank: The Complete Guide to Using Vegetable Oil as an Alternative Fuel. Biodiesel America. p. 53. ISBN 0-970-72270-2. ^ Inslee, Jay et al. (2008). Apollo's Fire: Igniting America's Clean Energy Economy. Island Press. p. 157. ISBN 1-597-26175-0. ^ Castrillo JI, Oliver SG (2004). "Yeast as a touchstone in post-genomic research: strategies for integrative analysis in functional genomics". J. Biochem. Mol. Biol. 37 (1): 93'106. PMID 14761307. http://www.jbmb.or.kr/fulltext/jbmb/view.php?vol=37&page=93. ^ Suter B, Auerbach D, Stagljar I (2006). "Yeast-based functional genomics and proteomics technologies: the first 15 years and beyond". BioTechniques 40 (5): 625'44. doi:10.2144/000112151. PMID 16708762. ^ Sunnerhagen P (2002). "Prospects for functional genomics in Schizosaccharomyces pombe". Curr. Genet. 42 (2): 73'84. doi:10.1007/s00294-002-0335-6. PMID 12478386. ^ Soni, S.K. (2007). Microbes: A Source of Energy for 21st Century. New India Publishing. ISBN 8-189-42214-6. ^ Moses, Vivian et al. (1999). Biotechnology: The Science and the Business. CRC Press. p. 563. ISBN 9-057-02407-1. ^ Langford, Roland E. (2004). Introduction to Weapons of Mass Destruction: Radiological, Chemical, and Biological. Wiley-IEEE. p. 140. ISBN 0-471-46560-7. ^ Eckburg P, Lepp P, Relman D (2003). "Archaea and their potential role in human disease". Infect Immun 71 (2): 591'6. doi:10.1128/IAI.71.2.591-596.2003. PMID 12540534. ^ Lepp P, Brinig M, Ouverney C, Palm K, Armitage G, Relman D (2004). "Methanogenic Archaea and human periodontal disease". Proc Natl Acad Sci USA 101 (16): 6176'81. doi:10.1073/pnas.0308766101. PMID 15067114.